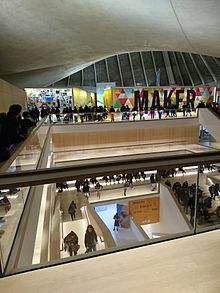 The Design Museum is a museum in Kensington, London, which covers product, industrial, graphic, fashion and architectural design. The museum operates as a registered charity, and all funds generated by ticket sales aid the museum in curating new exhibitions. Entrance is free to the museum's permanent collection display, "Designer Maker User". In 2018 the museum won the European Museum of the Year Award. Deyan Sudjic succeeded Alice Rawsthorn as Director of the Design Museum in 2006. In 2016 Alice Black was appointed Co-Director. The museum was founded in 1989 by Sir Terence Conran. 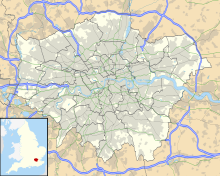 It was originally located by the River Thames near Tower Bridge, and later relocated to Kensington. The museum was originally housed in a former 1940s banana warehouse on the south bank of the River Thames in the Shad Thames area in SE1 London. The conversion of this warehouse altered it beyond recognition, to resemble a building in the International Modernist style of the 1930s. This was funded by many companies, designers and benefactors. The museum was principally designed by the Conran group, with exhibitions over two floors, and a “Design Museum Tank” exhibition space out by the waterfront. A large scale sculpture titled Head of Invention by Sir Eduardo Paolozzi was installed in the area between the museum and the Thames. In June 2011, Sir Terence Conran donated £17.5 million to enable the Museum to move in 2016 from the warehouse to a larger site which formerly housed the Commonwealth Institute in west London. This landmark from the 1960s, a Grade II* listed building that had stood vacant for over a decade, was developed by a design team led by John Pawson who made the building fit for a 21st-century museum, whilst at the same time retaining its spatial qualities. The Design Museum opened in its Kensington location on 24 November 2016. The move gave the museum three times more space than in its previous location at Shad Thames, with the new Swarovski Foundation Centre for Learning, 202-seat Bakala Auditorium and a dedicated gallery to display its permanent collection, accessible free of charge. The move brought the museum into Kensington's cultural quarter, joining the Royal College of Art, Victoria and Albert Museum, Science Museum, Natural History Museum and Serpentine Gallery. The top-floor space under the museum roof houses a permanent display, Designer Maker User, with key objects from the museum’s collection. It is the only one in the UK devoted exclusively to contemporary design and architecture. A restaurant, members’ lounge, residency studio and an events and gallery space are also located on the top floor. On the first floor, a design and architecture reference library is a resource for students, educators, researchers and designers. It will also include archive material relating to the history of the museum. The Swarovski Foundation Centre for Learning is a suite of learning facilities including a Design Studio, Creative Workshop, two seminar rooms and a Common Room. The Design Museum offices and main reception, a meeting room and a film studio are also located on the first floor. On the ground floor, the largest gallery in the new Design Museum showcases a programme of temporary exhibitions. Accessible from both Kensington High Street and Holland Park, the atrium welcomes visitors and acts as an events space. A main staircase from the atrium gives access to all floors and offers views to the first and second floors and the hyperbolic paraboloid roof. A double-height space spanning the two lower levels, Gallery Two hosts a programme of temporary exhibitions dedicated to architecture, fashion, furniture, product and graphic design. The Bakala Auditorium seats 202 people and provide a purpose-designed space for a programme of talks, seminars, debates and public and private events throughout the year. The basement accommodates a collections store, exhibition preparation spaces and a locker area for visitors. The Design Museum ran the £25,000 Designer of the Year award from 2003 to 2006; in its first three years it was televised on BBC Two. In 2007 the new Director discontinued the Designer of the Year scheme, and in 2008 introduced the Designs of the Year award. Brit Insurance sponsored the awards from 2003 until 2011. Designs produced over the previous twelve months worldwide are eligible. A number of internationally respected design experts are invited to nominate up to five projects each, falling into the seven categories of Architecture, Transport, Graphics, Interactive, Product, Furniture and Fashion. Since 2015 there have been six categories: architecture, fashion, graphics, digital, product and transport. Beazley Insurance came on board as exhibition sponsor in 2016. The Designers in Residence programme at the Design Museum is a core part of the museum's activity, and exists to provide emerging designers, across any discipline, with time and space away from their regular environment to reflect, research and consider new ways of developing their practice. 2010 - Theme: None. Residents: Asif Khan, Bethan Wood, Dave Bowker, Marc Owens, Farm: Giles Miller, Alexena Cayless, Sebastian Hejna and Guy Brown. Design Ventura challenges students in years 9, 10 and 11 to design a new product for the Design Museum shop. Design Ventura, the Design Museum's flagship learning project, provides students with the opportunity to develop design thinking, creative and business capabilities and employability skills. The project has been run since 2010 in partnership with Deutsche Bank as part of the bank's youth engagement programme, Born to Be, and has seen over 36,000 students in 588 schools participate. ^ "Charity Details for Design Museum". Charity Commission. Retrieved 10 November 2016. ^ "EMYA 2018: The Winners". European Museum Forum. Retrieved 19 September 2018. ^ Dowd, Vincent (24 November 2016). "Design Museum: A glossy new era and home". BBC News. Retrieved 24 November 2016. ^ Fairs, Marcus. "Yves Béhar wins Design of the Year". Dezeen. Retrieved 31 August 2013. ^ Etherington, Rose. "Shepard Fairey wins Design of the Year". Dezeen. Retrieved 31 August 2013. ^ Etherington, Rose. "Min-Kyu Choi wins Brit Insurance Design of the Year Award 2010". Dezeen. Retrieved 31 August 2013. ^ Sinclair, Mark. "Plumen lightbulb wins Design of the Year 2011". Creative Review. Centaur. Archived from the original on 25 March 2014. Retrieved 31 August 2013. ^ Etherington, Rose. "London 2012 Olympic Torch by BarberOsgerby wins Design of the Year 2012". Dezeen. Retrieved 31 August 2013. ^ "Gov.uk wins Design of the Year award". BBC News. Retrieved 31 August 2013. ^ "Zaha Hadid project in Baku wins Design of the Year". BBC. BBC. 6 July 2014. Retrieved 6 July 2014. 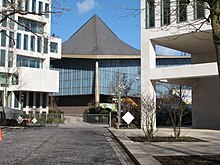 Wikimedia Commons has media related to Design Museum London.